At the start of the organ project in 2006 the cherished dream of having a restored Willis pipe organ at concert pitch seemed an extraordinarily long way off - we had a lot of fundraising to do and although I had thoughts of some of the pieces which would be possible one day, I kept them in mind as an added incentive to restore the instrument. A couple of years into fundraising, James Jarvis, who worked for J. S. Cowley & Sons (undertakers) and is a cellist with Milton Keynes Sinfonia and Bedford Sinfonia suggested using the Willis organ in a performance of Saint Saëns Organ Symphony however it wasn't possible at the time for two reasons - the organ wasn't reliable enough for such a big piece and also it wasn't at concert pitch, which meant that it could not be played with an orchestra (and indeed never had for this very reason ever since it was built in 1882). So we added 'concert pitch' to the bucket list of work which needed to be done if possible and kept on fundraising. 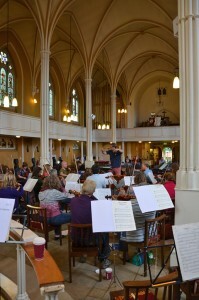 When the Heritage Lottery gave us the grant in 2014 we told various musical groups including MK Sinfonia about the plan to bring the Willis to concert pitch making it possible to play with orchestra and piano. Before long MK Sinfonia got in touch to say 'we want to do the Saint Saëns and please don't let any other orchestra do it with the Willis before us!' We worked out a date for their concert for November 2015 because at the time the expectation was that the restoration would be complete by then with a period of testing before the concert. 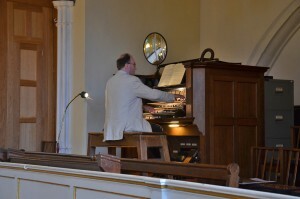 But it was not to be, as the job took 18 months rather than the planned 12 months (the organbuilders had an emergency job and a member of staff on long term sick leave). 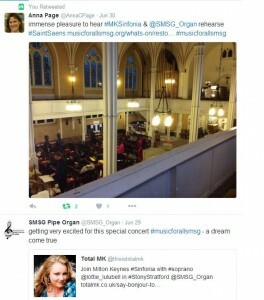 So MK Sinfonia changed their programme for the November 2015 concert and got to know the acoustic in St Mary and St Giles as the finishing touches were made to the organ restoration. One Thursday evening in June 2016 MK Sinfonia came to rehearse with the organ for the first time. They didn't mind people popping in to listen, however I listened through the keyhole only and heard an extract of the Saint Saëns. 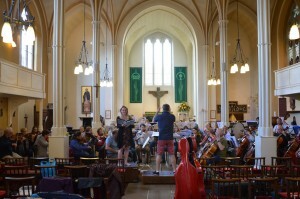 Two weeks later, a couple of days before the concert, they returned for a final evening rehearsal and this time I went into the church to listen for a while and took some photos. 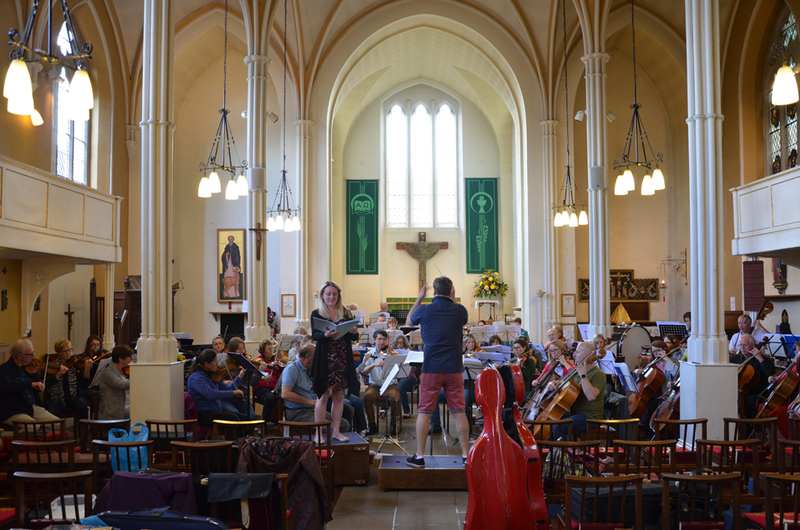 I must admit to a few tears on hearing the finale as I sat in the gallery that evening, it was quite a thrill to realise that this long awaited concert was really going to happen in our local parish church. 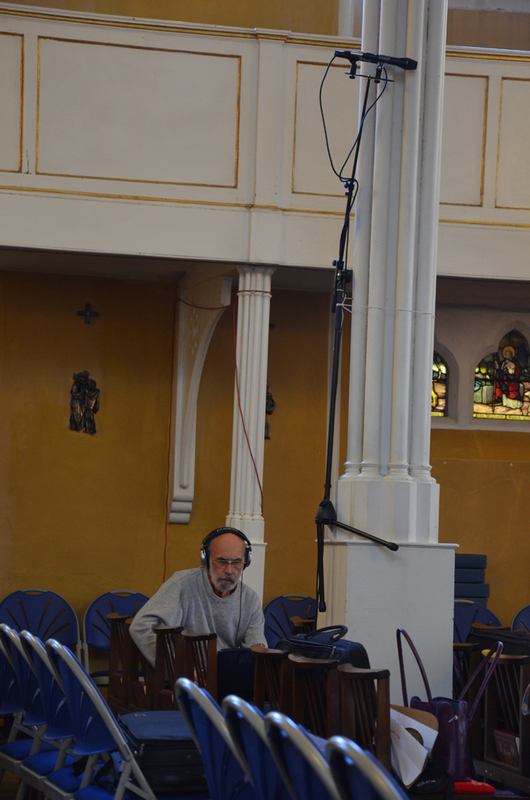 On Saturday John and I put up the microphones for the archive recording in time for testing sound levels during the afternoon rehearsal. 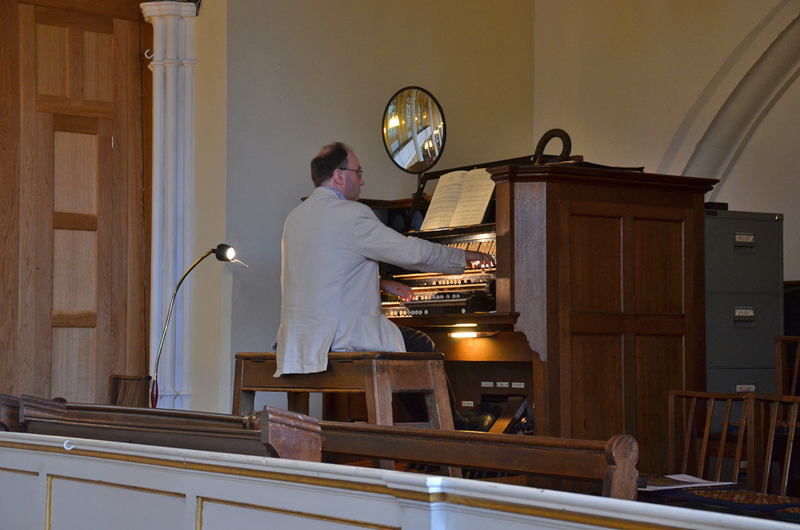 I quietly updated the organ project noticeboard while listening to the rehearsal and took a few photos as well. They rehearsed for nearly 3 hours, covering all three pieces. 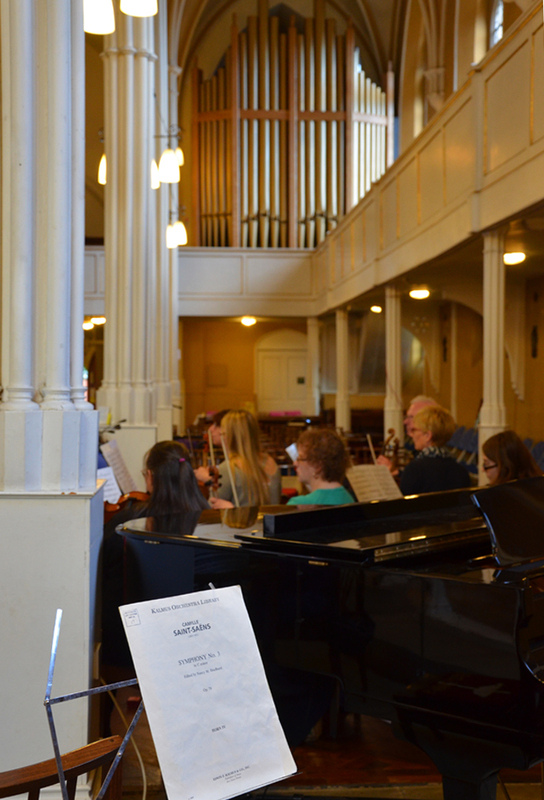 For the soprano soloist Lottie Greenhow, it was her first time singing in St Mary and St Giles Church and she made the Chants d'Auvergne sound effortlessly easy (they are not). During the afternoon other people popped into listen as the west door was kept open, including two families with children of various ages who sat and listened for a while - it was so good to give them the opportunity to hear a full sized symphony orchestra rehearsing in the town on a Saturday afternoon. They told me the sound of organ and orchestra rolling out the open door attracted them inside to hear more clearly.